Discription: Edition of 60 hand numbered copies. Deluxe aquarelle package. Savvas Metaxas (aka Inverz) is a notable musician, active for many years in the local scene of Thessaloniki. He has participated in various musical projects such as 2l8. Today he is a member of Good Luck Mr Gorski and a co-founder of Granny records. “Scenes” is a characteristic example of his experimentation with Modular Synthesis and vibration sensors. On this new solo album, Metaxas presents us four brand new compositions. In hs own words “they were created under a strong influence of the Solaris ocean“. He used mainly textured sounds of unconventional signal flow, various field recordings and low-frequency sound effects, made by contact microphones. Savvas Metaxas managed to produce a noisy sonic environment, that is dealing with an unexpected ambient sonic structure, carefully organised by resonance frequencies and sound events. 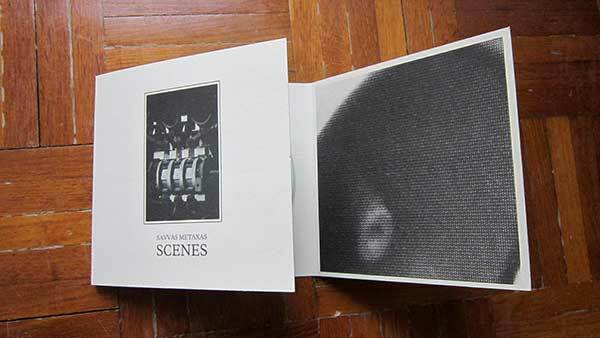 Scenes released as a limited edition of 60 numbered CD-r. Artwork made by Kocmoc Collective. Mastered by Yannis Tsirikoglou. All sounds recorded & mixed by Savvas Metaxas.